75% off all new HostNine web hosting plans! Recipient of the NCM Online award for Best Budget Web Host of 2015, HostNine’s already low prices just got a lot lower! 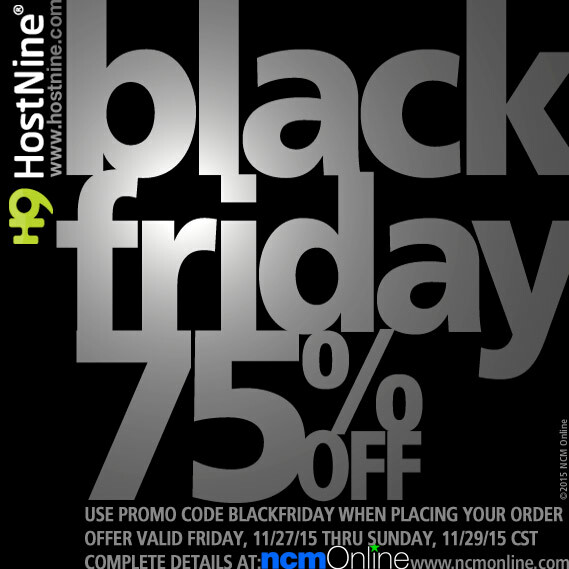 Beginning on Black Friday on November 27, 2015 at 12:00 AM CST, and running through 11:59 PM CST on Sunday, November 29, 2015, you can purchase any of HostNine’s fast and reliable web hosting plans for an incredible 75% off. Use the coupon code above when placing your order to benefit from HostNine’s brand of high-quality, high-speed, hosting for less than you ever imagined. This sale will not be extended, so you’ll need to act quickly to enjoy the massive savings. At NCM Online we devote our time and resources to providing users with the information that will allow them to select the best possible web host for their requirements. 80% of our ratings are based on hard data — not opinion. This ensures that users receive the most bias-free reviews available online. Of the 50 web hosts tested, rated, and reviewed by NCM Online, HostNine earned our second highest ranking. That would place them within the top 5% of all web hosts reviewed. It is worth noting that the companies tested included the best known web hosting brands in the US. We believe that HostNine will earn your highest recommendation as well. Black Friday offer applies to new hosting orders only. Not valid for renewals, domain registrations, or “add-on” services. Discounted services renew at the regular rate. Use the link immediately below to contact HostNine directly for definitive offer details including exemptions, and valid applications of discount.